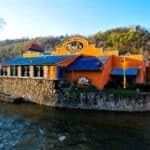 In Morristown, Tennessee, find No Way Jose’s Cantina at 1836 W. Andrew Johnson Hwy. We serve fresh, authentic Mexican Food in a bright and exciting atmosphere that’s perfect for the whole family. In the heart of East Tennessee, the city is conveniently located between Knoxville and Kingsport. Travel south and within a few minutes, you can access I-40 for easy trip planning or head north and drop your boat in beautiful Cherokee Lake! No Way Jose’s brings decades of service and tradition to the area. For years, we have served vacationers visiting the Great Smoky Mountains at our Pigeon Forge location and our flagship restaurant in Gatlinburg, TN. When visiting the area, local patrons and travelers will also find Holston’s Kitchen a delightful dining option. Located next door, Holston’s serves a fantastic menu including perfectly prepared steaks, seafood and rotisserie chicken.